Day Trip To Glasgow £12 Shopping, Museums & More With Stena Line- We Give It a Whirl! Yesterday we took a Glasgow day trip on the Stena Line ferry from the Belfast port to Cairnryan. It’s a service that runs on Tuesday, Wednesday and Thursday for £12 per person, or Saturday for £15 per person. It includes travel by ferry across to Scotland and return travel by coach from the port to Glasgow, with aprox. four and a bit hours to spend in the city shopping, visiting museums, or doing whatever you want to do with your time. There is a hop on hop off Glasgow city bus tour you can take similar to London, or our own here in Belfast if you want a tour of the city’s which takes just under an hour and a half. Here are some details of the Day Trip and our day yesterday if you want to know more about the offer for families who might be thinking about going over the spring or summer ahead. Your online details are here. You leave on the regular Stena Line Superfast sailing from the Belfast Port, with latest check in at 7am. You can park you car easily in their large car park right outside the terminal. Check in is very easy. You won’t need your passport or anything, but it will be handy for adults to have some form of photo ID with them I expect, although we weren’t asked for anything, just our booking reference. When you board the ship has many lounges and you can find somewhere where you family is comfortable to sit during the sailing, which is around two hours fifteen minutes. You can move around between lounges as much as you want during the sailing. There are different styles of lounges and bars, with two decks, seven and eight, where you can relax. The pod lounge is great for kids and teenagers to hang out and play. There’s also a small cinema with a film showing during the sailing. The Taste restaurant is serving breakfast during the Scotland bound sailing, and an evening meal on the sailing back. They also have free refills of coffee and tea for hot drinks purchased. There are family meal deals offered. The Guest Services Desk had this very handy map I picked up that we ended up using the whole trip to find our way around the city. I would highly recommend getting your hands on it if you pass by the desk. The crossing was very relaxing. Don’t forget there are also spa treatments available on the top deck, ask at guest services about manicure and pedicure services! Also more about the brand new Hygge Lounge at the end of this post. We arrived at the Scottish port shortly after 10am, and our coach was waiting outside the terminal. It was drizzly, but the drive down the coast was still quite beautiful, it’s a lot like our north coast for the first twenty miles or so before you head in-land. We arrived into Glasgow city centre at 12.15pm and the rain had stopped. The coach drops you at Buchanan Bus Station which is at one end of the shopping mile, so you can just head in one direction to get to everything so it’s very handy. We were very hungry, so we headed to find some food first, and lucky came across a Yo Sushi straight away, so were very happy. Glasgow is a lot like Belfast in that everyone is very happy to help you with directions. We must have asked people directions at least six times, and everyone helped us! After we ate we argued over what to do. I wanted to do the bus tour, but Smix didn’t want to. We agreed on the Museum of Modern Art, then shopping. I was heartbroken that the Duke of Wellington was sans cone! Even the merchandise inside the museum had the cone on his head! For families The Riverside Museum, a fascinating collection of trams, locomotives, cars and bikes with hands on interactive fun. And it’s free to visit. You can also climb aboard the The Tall Ship Glenlee berthed alongside, while across on the other side of the River, sits the titanium clad futuristic structure that is the Glasgow Science Centre – a must visit family attraction with 3 floors of interactive hands-on fun. The St Enoch Centre is a great place to head with the Disney Store and Hamleys or head to Buchanan Galleries for Scotland’s only Lego Store and The Entertainer toy shop. The Style Mile has a lot of luxury shopping, it reminded me of Dublin’s Grafton Street. Fashionistas will not be disappointed. I was so excited to find Krispy Kreme. I bought a box of three to bring home. When we got back on the coach half the coach had dozen boxes! When will they just open stores here? We ended our shopping marathon at Buchanan Galleries which has a huge John Lewis, and it’s right beside the bus station so we knew we would make it back to the coach for the 4.20pm curfew. It’s a perfect amount of time to have a spin around a new city and have some fun. We had a lovely afternoon. The Cairnryan to Belfast sailing left the port at 7.30pm and we were booked into the brand new Hygge Lounge, which opened this week. It’s £5 per person and offers reclined luxury seating in a private lounge. Hygge (pronounced hoo-gah) is a Scandinavian concept which conveys a therapeutic sense of cosiness, comfort and well-being. The Lounge is super comfy, quiet, and very luxurious. I would definitely pay the extra £10 per crossing for Smix and myself for the lounge for a number of reasons. There was a little bit of sway on the return journey, and I get travel sickness very easily, but being able to lie back made it go away instantly. You get a lovely cosy blanket, and Smix had fallen asleep on the early morning journey out, so that would have been perfect if we had have been in there on the way out. I would say it probably best that it’s not for younger children however. Smix is now ten and I told him he had to be quiet, and he wasn’t allowed to go in and out of the door of the lounge often. It is a place for people to rest and for some people to nap on the crossing, so if you do have kids who are little, it probably isn’t the best place to book. There are private cabins on the top deck you can book for £35 per crossing that might work out better for you with a bed then you get a whole room to yourself. The Hygge also has a charging station for your gadgets, and a reading light, plus big TVs (which are on silent with subtitles) showing 24 hour news. After a long day it really was like a little lounge like heaven. Both of us had a great time. 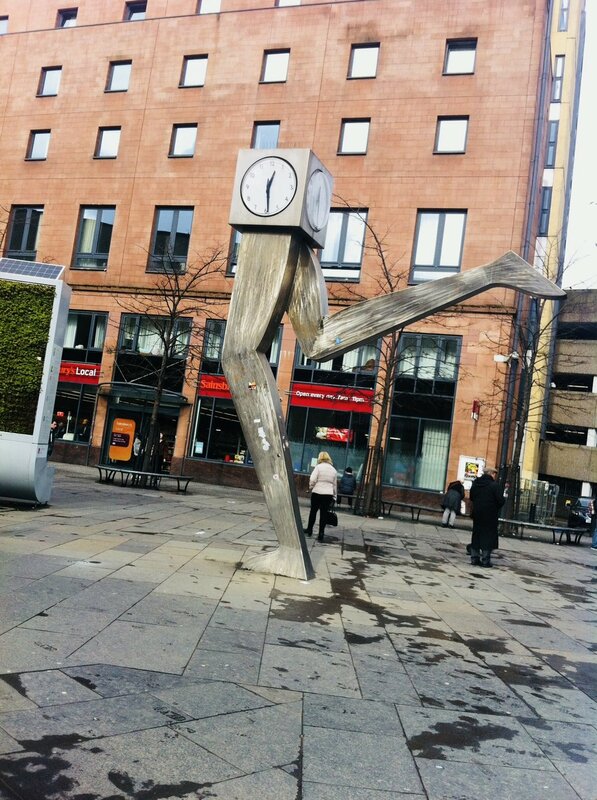 I would recommend the Glasgow Day Trip to any family, couple, shopping buddies, adventurer alike!